This trilogy, a pillar of Scandinavian literature, follows a woman's life in 14th century Norway from the innocent naïveté of first love, to the inexorable passion that sets her at odds with her beloved father and dictates her destiny, through the pains and disillusionments of married life, to the bitterness and reflections of old age. More than just an engrossing evocation of medieval Norway, Kristin is a profound observation of life and the heart, relevant in any age. A haunting masterwork. This Penguin Classics Deluxe Edition includes an introduction by Brad Leithauser and features French flaps and deckle-edged paper. Undset’s first published works—the novel Mrs. Marta Oulie (1907) and a short-story collection, The Happy Age (1908)—were set in contemporary times and achieved both critical and popular success. With her reputation as a writer well-established, Undset had the freedom to explore the world that had first fired her imagination, and in Gunnar's Daughter (1909) she drew upon her knowledge of Norway's history and legends, including the Icelandic Sagas, to recreate medieval life with compelling immediacy. In 1912, Undset married the painter Anders Castus Svarstad and over the next ten years faced the formidable challenge of raising three stepchildren and her own three off-spring with little financial or emotional support from her husband. Eventually, she and her children moved from Oslo to Lillehammer, and her marriage was annulled in 1924, when Undset converted to Catholicism. 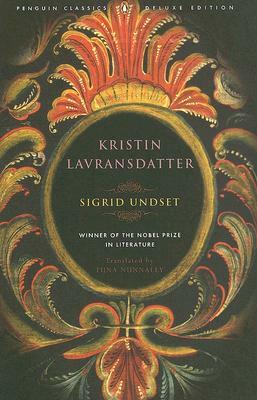 Although Undset wrote more modern novels, a collection of essays on feminism, as well as numerous book reviews and newspaper articles, her fascination with the Middle Ages never ebbed, and in 1920 she published The Wreath, the first volume of her most famous work, Kristin Lavransdatter. The next two volumes quickly followed—The Wife in 1921, and The Cross in 1922. The trilogy earned Undset worldwide acclaim, and her second great medieval epic—the four-volume The Master of Hestviken (1925–1927)—confirmed her place as one of the twentieth century’s greatest writers. In 1928, at the age of 46, she received the Nobel Prize in Literature, only the third woman to be so honored. Undset went on to publish more novels—including the autobiographical The Longest Years—and several collections of essays during the 1930s. As the Germans advanced through Norway in 1940, Undset, an outspoken critic of Nazism, fled the country and eventually settled in Brooklyn, New York. She returned to her homeland in 1945, and two years later she was awarded Norway’s highest honor for her “distinguished literary work and for service to her country.” The years of exile, however, had taken a great toll on her, and she died of a stroke on June 10, 1949. Brad Leithauser is the author of several novels, four volumes of poetry, and a collection of essays. He is the Emily Dickinson Lecturer in the Humanities at Mount Holyoke College.